A lot of computer users look like receptionists these days. Voice chat in games, Internet telephony, voice recognition packages for those unable or unwilling to type; all provide good reasons to hook a microphone onto your head, rather than sit it on the desk or monitor where it'll be more susceptible to background noise. And if you want a head-mike, you probably want a headset. Headphones with a mike poking out of one earpiece are virtually standard equipment for online gamers these days. You can get cheap headsets; nasty ones start from less than $US20, and here in Australia a you can buy a not-too-bad set from Aus PC Market for $AU36.30, including delivery. 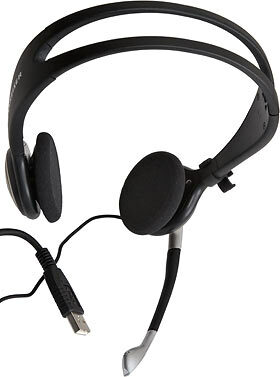 This headset, however, costs $AU242 delivered. It's Sennheiser's PC 135 USB, and I'm happy to say it's got a feature set that justifies its price. Including, as the name suggests, USB connectivity; you can hook this headset up to any current Windows or Mac OS box and it'll automatically install as a new audio adapter and microphone, separate from the existing sound card, if there is one. USB audio devices don't suffer the noise rejection problems of internal audio adapters, they let you set up music to go to the headphones while system sounds go to the speakers, and they let you add audio output to sound-card-free business boxes without even cracking the case. Not everybody needs USB connectivity in a headset, of course. If you do, though, the PC 135 is a downright elegant solution. 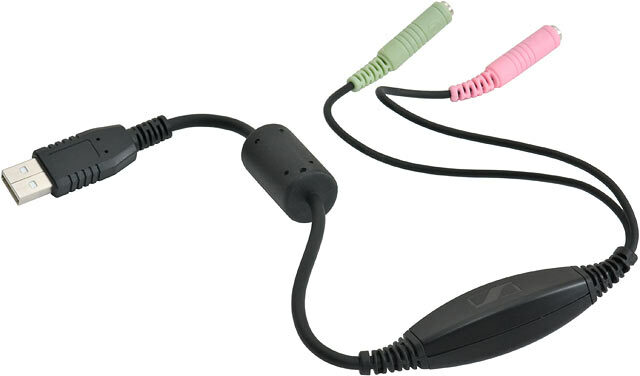 The PC 135 is not a USB-only product; it's actually a plain old analogue headset and mic, plugged into a USB adapter module with standard 1/8th inch connectors. The headset without the adapter can thus plug into any standard sound card; the adapter without the headset can be connected to any other twin-plug headset, or to plain old headphones (leaving the mic socket unconnected). Here's the adapter. It's a simple little nugget with no controls, and no way to get into it without considerable brutality, so I'm not sure what interface chip it uses. The PC 135 is an open-back design; the transducer modules aren't sealed, so the rear wave from the drivers can escape through the back. The open-back design lets in more ambient noise, but also makes it easier for the designers to get (relatively) long throw out of the drivers. You can see the vent holes in the back of the earpiece in the above picture. The foam earpads just pop over the whole driver assembly, as is normal for these kinds of headphones; you don't have to dismantle the earpieces to install new pads. I just felt like doing it. The mic boom can rotate almost 360 degrees, and is also bendable, so you can curl it close to your lips, or bend it out to avoid your beard, or whatever. The above picture shows a little rubber clip attached to the headband, into which you can click the microphone boom when you swing it up. If the clip isn't just a piece of overdesigned packing material, then it's not very useful; it fell off the headband easily enough that you'd probably lose it pretty quickly, and the boom stays in place by itself anyway. The headphone cable has some lumps in it. One of them has a thumb-wheel volume control for the headphones - it lets you turn the 'phones a long way down, but you can't quite silence them with it - and a switch that turns the mic on and off. The big oval thing's a cable spool. The PC 135 comes with a generous three metres of cable; you avoid tangling yourself up in the excess by winding it around the spool and then tucking it through little slots in the spool's ends to secure it. The spool has a belt clip on the other side. This is a good solution; even if you plug the 'phones into the back of a computer and need to thread the cable back around a big desk, you'll still have more than enough wire - but you could go for a walk using the PC 135 with your MP3 player and not be dragging wire behind you. The cable also comes with a little lapel clip, to protect the relatively fragile entry point on the headphones from being stressed every time something pulls on the cord a bit. Note that there's only one entry point, on one side of the headphones; the wire passes through the headband to the earpiece on the other side. This is another good feature; single-cable-connection headphones like these won't snag on your neck when you take them off. 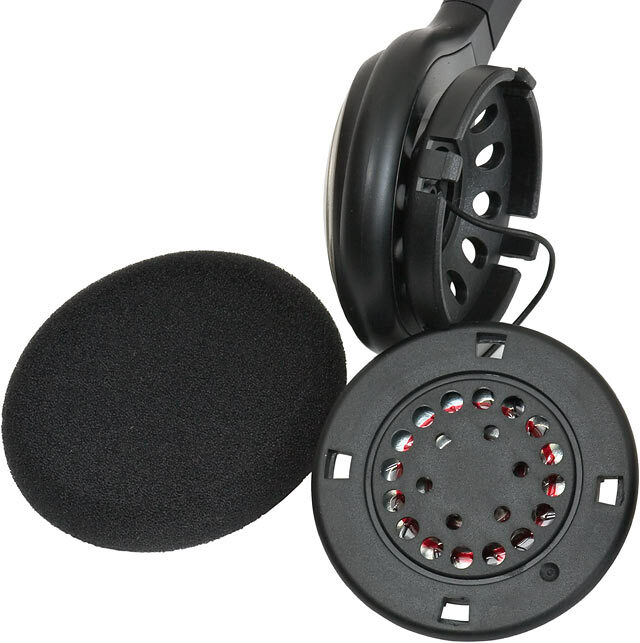 The PC 135 earpieces are flat, hard plastic covered with a thin layer of foam. There is no way to make such a design truly comfortable. The PC 135 headband isn't a skull-clamping monster, though, and it's adjustable to fit all but the very largest of heads. And the earpieces pivot far enough to sit flat on your ears, not squish one edge unduly. If you're not wearing the PC 135 all day, you'll be fine. The headset certainly isn't going to give you neck strain; it only weighs about 90 grams (3.2 ounces), depending on how much cable you include. I didn't expect remarkable audio quality from this headset, because I never expect very good sound from a headset. I was, however, very pleasantly surprised. 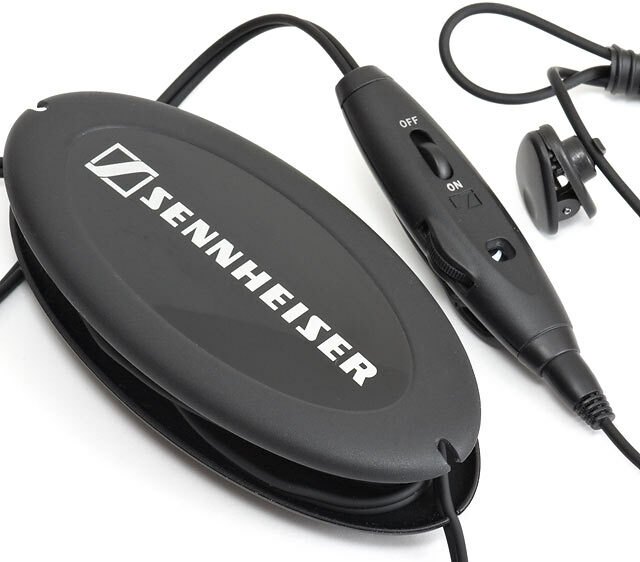 Sennheiser have not decided that it's OK to let their standards slide just because this product's likely to be used by people who aren't paying a lot of attention to sound quality. 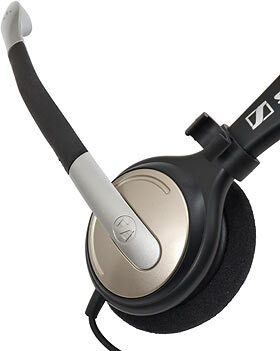 Within the inescapable limits of a small-to-medium set of headphones, the PC 135 does a very good job indeed. Solid bass, smooth midrange, and none of the nasty toilet-paper-tube resonances that cheap plastic headphones are famous for. The treble's a little on the tizzy side at times, but you can tweak that in Windows' Advanced control panel for the USB audio device. Audiophiles'd have conniptions about doing that, but audiophiles aren't buying headphones with boom mikes. The maximum volume the PC 135 can manage with everything turned up to eleven on PC and in-line controller is only moderate; it verges on headache-inducing with the loudest program material, but that's it. This is OK; the headset's output is more than capable of cutting through the background noise of a typical overclocker's computer room, and constant high volume's just going to damage your hearing, anyway. By the standards of headphones with boom mikes, the PC 135 sounds exceptionally good. You can, of course, buy lightweight headphones that cost less than the PC 135 and sound just as good, but that's all they do. The PC 135 USB is a package deal. The microphone is perfectly good, too. It's a noise canceling unit with a second pickup on its outside face, away from your mouth; whatever that pickup hears is subtracted from what the other one hears, and the result is consistently clear recording, even of quiet speech when there's lots of background noise. A concert quality vocal mic this is not, but for its intended purpose it's perfect. If you need a headset but you don't have much to spend, then the PC 135 USB is not the headset for you. Likewise, there's not much point buying it if the included USB audio adapter's not something you need. The cheaper PC 140 or PC 150 headsets would suit you better, in that case. I'll be reviewing them soon. If you do want a good-sounding, quite comfortable headset that can plug into regular headphone sockets and sound-card-less computers, though, the PC 135 USB gets the job done in style. It sounds better than I expected, it installs instantly, and it's really not that expensive, for what you get. Readers from Australia or New Zealand can purchase the PC 135 USB from Aus PC Market. The BitHead amp swings both ways, too.